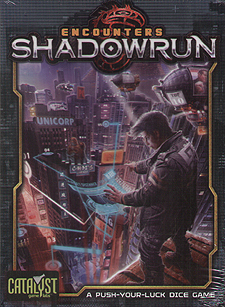 Encounters Shadowrun is a 1-8 player fast-paced, push-your-luck dice and card game. Players take the role of Mr Johnson, arranging the megacorps' dirty work and adding new shadowrunners to their already-assembled teams. They send their teams into the shadows of the mean sprawl streets of the Sixth World, collecting enough paydata to beat down their rivals. Grab some dice, make a team, and show 'em who's the boss.